Turkish voters narrowly approved the constitutional changes in a referendum last year after President Tayyip Erdogan said they were needed to help tackle the security and economic problems facing the country. Ankara: Turkey’s president will acquire sweeping new executive powers after snap presidential and parliamentary elections on Sunday. Turkish voters narrowly approved the constitutional changes in a referendum last year after President Tayyip Erdogan said they were needed to help tackle the security and economic problems facing the country. Erdogan’s challengers include Muharrem Ince from the main opposition Republican People’s Party (CHP), jailed former pro-Kurdish leader Selahattin Demirtas and former interior minister Meral Aksener from the fledgling Iyi (Good) Party. If no candidate receives more than 50 per cent of votes on June 24, a run-off will be held on July 8 between the two best-performing candidates. 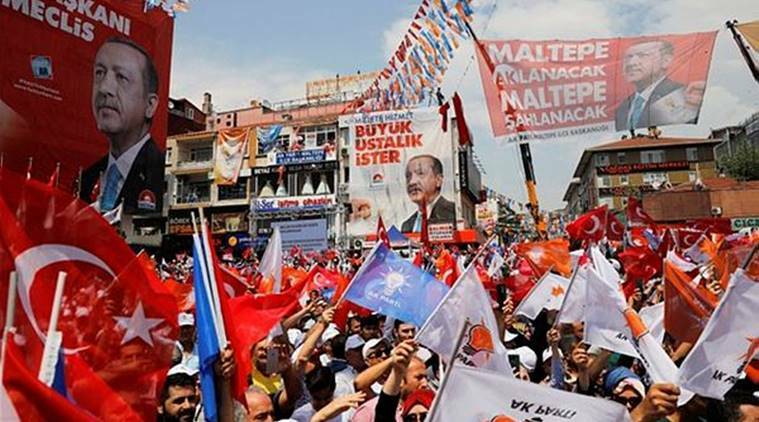 Erdogan’s ruling Islamist-rooted AK Party will contest the parliamentary election in an alliance with the nationalist MHP party, while the secularist CHP has formed a rival tie-up with the Iyi Party and the small Saadet Party. The pro-Kurdish Peoples Democratic Party (HDP) will run without a partner. * The office of prime minister will be abolished. The president will appoint the cabinet and an undefined number of vice-presidents. * The president will be able to issue decrees to form and regulate ministries and appoint and remove senior civil servants, all without parliamentary approval. * Decrees will not be allowed on issues concerning human rights or basic freedoms, or to override existing laws. Courts will decide if a decree interferes with the law. Critics say the vague wording of the legal code – and the judicial system’s reputation for partiality – means rulings may lack independence. * The president will be able to declare a state of emergency for up to six months and no longer require cabinet approval to do so. During the emergency rule, the president will be able to issue decrees on basic rights and freedoms. * The president will be able to draft the budget, currently drawn up by parliament. * The State Supervisory Board (DDK), a presidential institution that oversees the activities of public and private bodies, will be able to open administrative investigations, giving the president direct power over a wide range of groups, including the armed forces. * Members of the Board of Judges and Prosecutors (HSK) are now appointed by the president and parliament. The president appoints four members and parliament seven. The justice minister and his undersecretary are automatically members. * Parliament will be expanded to 600 seats from 550. The minimum age to be elected will be lowered to 18 from 25. Lawmakers will not be allowed to serve in the cabinet, meaning any parliamentarian appointed minister will have to resign their seat in the assembly. * The president will be able to dissolve parliament, although that would also trigger early presidential elections. * The president will be able to serve a maximum of two five-year terms. If parliament decides on early elections during a president’s second term, the incumbent can run again. * While the president does not need parliament’s approval in drafting decrees on executive matters, a decree will become invalid if parliament passes legislation on the same matter. * While the president can declare a state of emergency for up to six months, the decision will be sent to parliament on the same day. Parliament has the authority to shorten, extend or cancel this decision. * If the opposition wins a parliamentary majority in the June 24 elections, a simple majority of 301 votes will be enough to lift the current state of emergency, which was introduced after an abortive coup in 2016. * Presidential decrees passed during a state of emergency must be approved by parliament within three months, or become invalid. * If parliament does not approve the budget proposed by the president, the previous year’s budget will be increased in line with the “revaluation rate” and implemented. * Parliament will elect its own speaker, meaning an opposition majority assembly could provide a platform for a prominent opposition member to moderate the legislative process. * Opposition parties have vowed to switch back to the previous parliamentary system if they win the elections. With 360 votes in favour, the assembly can put its proposed changes to a referendum. With 400 votes, it can skip a plebiscite altogether.